It is relatively simple to travel directly in either direction between Hong Kong Airport and Macau. As well as allowing you to save time by bypassing Hong Kong centre, for passengers going from Macau directly to Hong Kong airport it also can save some money, as they are eligible for a rebate on their HK departure tax. At Hong Kong airport there is an area called Skypier, which facilitates transfer to and from ferries without passing through Hong Kong immigration or customs formalities. That means you can arrive and transfer to Macau without clearing immigration and customs, or check in at Macau and connect in HK without clearing immigration or customs in HK. Some airlines allow you to check baggage through all the way without needing to recheck it at Hong Kong airport (a list of participating airlines on Turbojet services is here under “Tag Through Baggage Service”, and on Cotai Water Jet services is here under “Baggage Tag Through Services”). Transfer to the Skypier is clearly marked in the airport and you do not pass through HK immigration. However, if you require a visa to transit or enter Hong Kong, you may be denied boarding to your flight without it. There is a ticket counter where you can buy tickets, if you have not bought one in advance (on which, see our post on buying cheap ferry tickets to Macau). You need to check that your baggage is transferred if it is not checked through – the ferry ticket reader shows baggage status. You can then board the ferry, and will clear customs and immigration in Macau. The airport has a diagram showing the process here. You need to check in at Macau at least half an hour before ferry departure, and allowing a minimum time from your arrival at HK airport to the scheduled flight departure time (this varies from 65 to 120 minutes depending on airline and whether you check baggage. Details are on the ferry websites). If you do not meet this minimum connection time you may be denied boarding of the ferry even if you still feel you have time to make the connection. 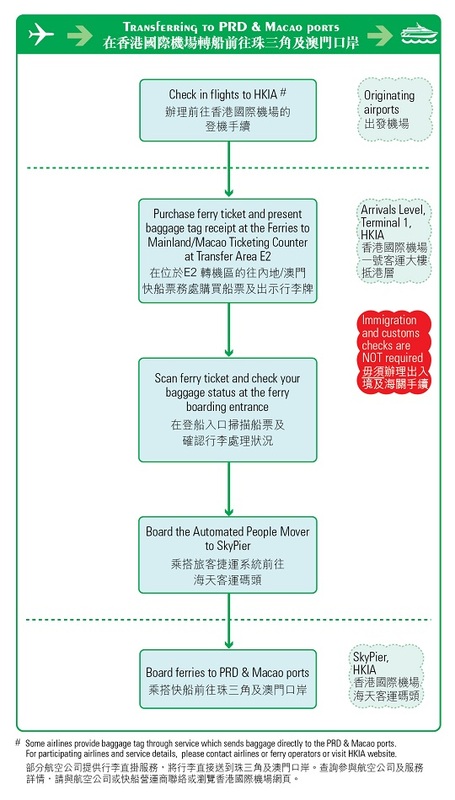 You can clear immigration and customs at the ferry terminal in Macau. However, if you require a visa to transit or enter Hong Kong, you may be denied boarding to your ferry without it. You can check in for your flight and check your baggage at the ferry terminal – whether you need to reclaim it once at HK airport and then recheck it, or it is tagged through to your onward destination, depends on which airline you fly, as above. As they do not enter Hong Kong borders, each passenger is eligible for their departure tax (usually prepaid in the flight ticket cost) to be refunded. This is typically $120 per person. Usually this involves getting a voucher after checking in at the Skypier, which can then be exchanged for a refund). It is also now possible to book codeshare flights on select ferry journeys to or from Macau. Cathay Pacific offers codeshares on Cotai Water Jet services between Hong Kong airport and Taipa Ferry Terminal. These are currently available to passengers in select markets only (Australia, Canada, New Zealand, Singapore and the U.S.). For timetables see the website of the operators: Turbo Jet (which we reviewed here) and Cotai Water Jet (which we reviewed here). You may also want to read our post on getting cheap Macau ferry tickets. A bus between the Hong Kong-Macau-Zhuhai Bridge port (near Hong Kong airport) and Macau costs around $65 for a one-way adult fare and there are multiple buses per hour in both directions. From Hong Kong airport, you can pick up many buses to the port for $6 one way, or a taxi. However, if you do this you will need to clear Hong Kong immigration twice (entering and leaving), which you will not need to do if you take the ferry. Plus, going from Macau to HK, as you will enter HK when clearing immigration, you will not be eligible for a rebate of the HK departure tax as you would be if arriving on the direct ferry to HK airport. Is It Worth Visiting Macau? Do you know something about bridge connection these days. Impossible found info in the net.